Slaven Bilic has hinted Declan Rice will be given a chance to impress for West Ham this weekend. Declan Rice pictured playing for West Ham's U21s. IRELAND UNDERAGE INTERNATIONAL Declan Rice could be set for a Premier League debut this weekend. Ahead of the Hammers’ final game of the season away to Burnley on Sunday, manager Slaven Bilic spoke in glowing terms about the player, who can play in defence and midfield. 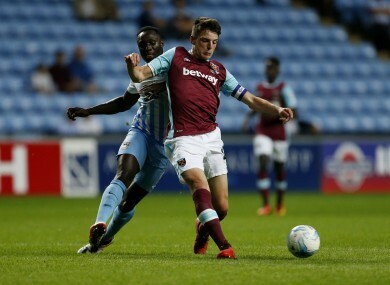 18-year-old Rice, who is captain of the club’s U23 side, could come into the team in the absence of the injured Winston Reid, who underwent knee surgery this week. Italian defender Angelo Ogbonna, meanwhile, only recently returned to full training after a knee problem, which means Rice — who has already appeared on West Ham’s bench this season — could be in line for a surprise start at Turf Moor. “We’re going to see,” Bilic said, when asked if Rice could feature this weekend. “We have a game on Sunday and we have many injuries, but he’s one of them that may play. He’s in the squad. “Declan is very good for his age. He is extremely good, he is mature and it’s all based on the training and he plays very well for the U23s. He has a bright future in him and it’s all down to him. Rice has represented Ireland since U16 level and was involved in an Ireland U21 squad training camp in La Manga. The teenager, who was born in London but qualifies for the Boys in Green through his Irish-born grandparents, was named Ireland U17 International Player of the Year back in March, while in the same month, he penned a new three-and-a-half year contract with his club. Email “Irish underage international could be set for Premier League debut”. Feedback on “Irish underage international could be set for Premier League debut”.